Southern Illinois University Edwardsville’s 2,660-acre campus features expansive natural beauty, enhanced by an array of beautiful student-generated artwork, each of which holds special meaning. This year, 10 new large-scale sculptures were installed across campus through the Sculpture on Campus program. 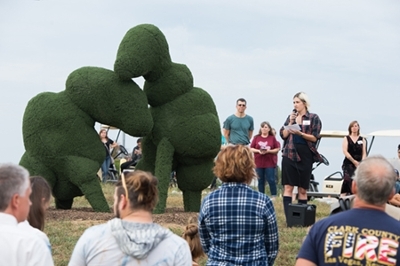 Student artists shared the inspiration behind their pieces on Friday, Oct. 6, as approximately 300 campus and surrounding community members attended the 17th Annual Sculpture Walk. This year’s participating student artists included Chelsea Belcher, Sarah Bohn, Benjamin Carey, Jessee Crane, Brad Eilering, Dara Garcia, Samantha Hunerlach, Jessica Hunt, Alex Jacobs, Joseph Ovalle and Sarah Walters. 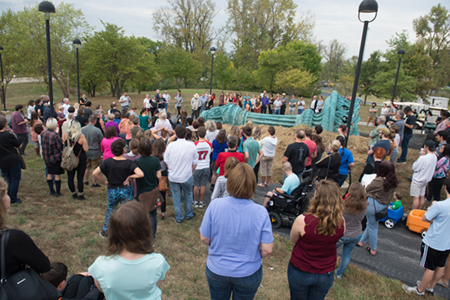 The original sculpture designs will remain on display on the SIUE campus for one year. “Age of the Extinguished” is a new sculpture on campus, created by Alex Jacobs and displayed near the Engineering Building.